Huawei P9 Lite gets Android 8.0 Oreo EMUI 8.0.0 update – How to Download? Leave a Comment on Huawei P9 Lite gets Android 8.0 Oreo EMUI 8.0.0 update – How to Download? Following the stunning P9 (Plus), the Huawei P9 Lite and all of its variants have started receiving the EMUI 8.0.0 firmware update based on Android 8.0 Oreo. Huawei P9 Lite (2017) finally receives the Oreo OTA update in various regions across the globe. 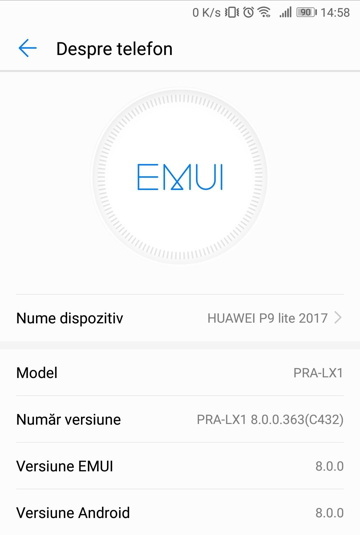 A user in Romania has reported of receiving EMUI 8.0 OTA update on his P9 Lite device with model number PRA-LX1. Unfortunately, the previous Huawei P9 Lite 2016, , also known as G9 Lite, Honor 8 Smart in various regions, may get the similar OTA once all the P9 and P9 Plus devices gets updated. See how to download and install EMUI 8.0 Oreo OTA update right now. How to download Android 8.0 Oreo EMUI 8.0 for Huawei P9 Lite? As the Huawei P9 Lite OTA update is rolling out in Romania, your best bet to receive Oreo OTA update is by changing your device location to Romania or China. As we did with the Huawei P9 and P9 Plus, we are going to do the same here. See instructions below. Download and install Huawei’s official HiCare app from Play Store. You will be asked to set a location or region. Set the location to Romania in Europe or China/Chinese in Asia-Pacific. Give proper permissions when prompted. HiCare app detects your location automatically. When prompted, do not change the location back to your own country. Once setup, go to HiCare main page. Let it download necessary content for your device. Once done, you will be get a new firmware update. Most likely the latest Android 8.0 Oreo. If you still don’t see the Oreo update for Hauwei P9 Lite, try going to settings and check for software updates manually or the HiCare app. Next Entry How to disable Heads Up Notifications on any Android device easily?